Residential property has increased significantly with new developments on the South Bank district and there are future plans to produce 18,000 homes over the next decade. Commercial property is set to rise also, with a multitude of offices, shops, restaurants, leisure facilities and hotels. This rise in commercial property will bring more employment to the area and more residents, producing a thriving community. Property to let in Nine Elms is becoming increasingly popular not only for property development, but also new developments to improve culture and community in the area. Plans to develop public spaces, including a public park for theatre and dance performances, markets and events is being put into motion to help create a vibrant community. Furthermore, new parks are being developed to provide pedestrian and cycling routes through the area. More access to the area and open leisure spaces will give Nine Elms a relaxing feel often lost amongst the many skyscrapers of cities. 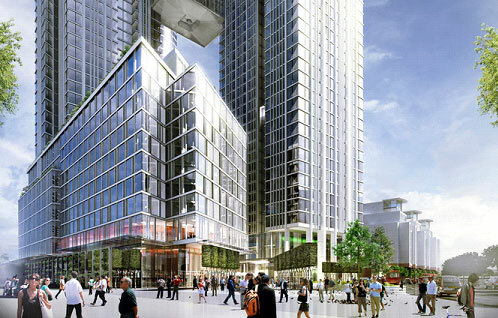 The riverside location in Nine Elms is one of the main factors why people choose to live there. Unfortunately, until now there has been little access to the riverside due to industrial buildings and sites. However, new developments to access the riverside through railway arches onto the Albert Embankment could solve this problem. This would make public access much easier and will expand transport routes, reducing congestion at peak busy times. Properties to let in Nine Elms are extremely popular due to its excellent location in Zone One with easy access into Central London. This often encourages professionals to move to the area as it is a quick, easy commute to work. Transport is set to improve even more with new bus routes, improvements to Vauxhall station as well as cycling routes and riverboat services. Nine Elms has significantly veered away from its industrial past and is becoming a culture hotspot, with new cafes, restaurants and galleries populating the area. Furthermore, the revived Battersea Power Station and access to Covent Garden Market has made the area an even more popular destination. Being in prime position between Vauxhall and other destinations such as Clapham Junction, Pimlico and the House of Parliament make property to let in Nine Elms incredibly popular and a brilliant place to live. If you would like more information about property to let in Nine Elms, talk to someone at Henry Wiltshire today.